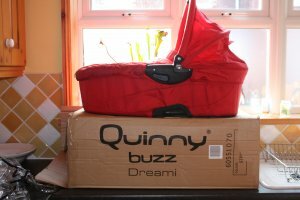 Strawberry red dreami carry cot comes with a mosquito net , rain cover and red blanket. In very good condition. Also comes with the adaptors to fit on to the quinny chases . Still has the box it was delivered in. From a smoke free home.